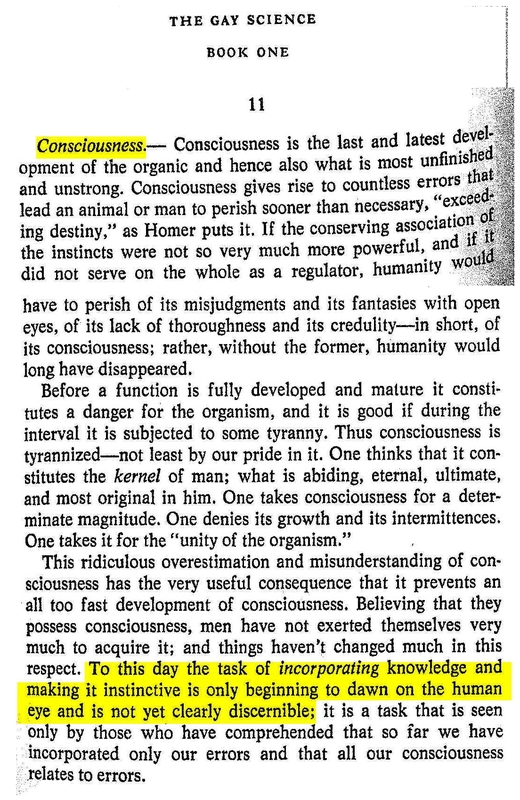 When people ask me whether I think computers need to have consciousness in order to be truly intelligent I like to show them the following short piece on consciousness by the famous philosopher Friedrich Nietzsche. The yellow highlights are mine. I found the piece in Nietzsche's book of short pieces titled The Gay Science : With a Prelude in Rhymes and an Appendix of Songs. My interpretation of Nietzsche's piece, and the lesson I think we should draw from it regarding consciousness and AI. Interesting comments made by Michael Collins. Michael sees Nietzsche's comments as a precursor to the behavioristic approach to psychology and linguistics. He quotes from a critical review written by Noam Chomsky on the book Verbal Behavior by B.F Skinner. I don't think Nietzsche is advocating a black box approach to the analysis of human behavior, neither would I. On the other hand, I do believe that a behavioral approach is critical when developing practical AI systems in general and speech recognition systems in particular. The result might be a system that has the desired behavior but is hard to explain. In that case it would be fair to say that the software system is similar to a human in that both cannot be explained by a simple model.